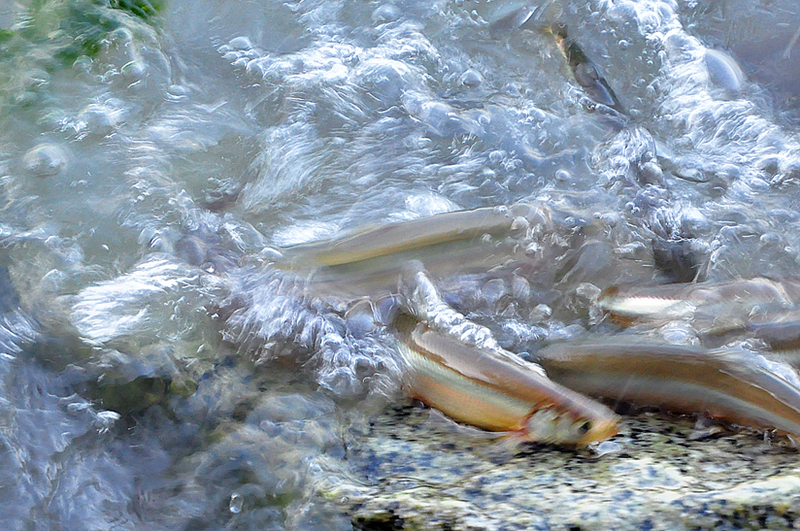 The “squeeze” is on for surf smelt and sand lance, two kinds of forage fish whose spawning habitat is being eaten away by climate change. In places where shorelines are armored with bulkheads, rising sea levels could wipe out 80 percent of the forage-fish spawning habitat before the turn of the century — unless steps are taken to protect natural shorelines, according to studies by the Washington Department of Fish and Wildlife. Forage fish are considered a key part of the food web, providing essential nourishment for sea birds, marine mammals and many kinds of fish, including salmon. Surf smelt and sand lance lay their eggs in sand and gravel on intertidal beaches where rising and falling tides cover the eggs with water for a portion of the day. Surf smelt seem to prefer somewhat higher areas on a beach, where their eggs are under water less time than sand lance eggs. 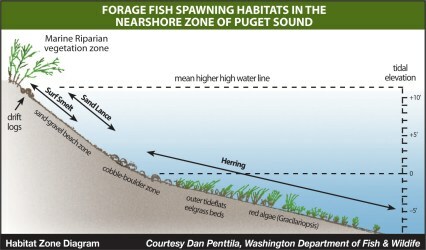 Surf smelt eggs have been documented on 275 miles of Puget Sound shoreline, or about 11 percent of the total. Sand lance eggs have been documented on 5 percent of the shoreline. The actual amount of forage fish habitat is unknown, since some areas have not been surveyed and some areas may have been surveyed at the wrong time. Under natural conditions, rising sea levels tend to push sands and gravels higher up the beach, according to coastal geologists. In locations free of structures, sandy habitat used by forage fish might remain intact, moving to higher elevations on the same beach. What concerns biologists are the long-term effects of bulkheads, which are generally constructed to prevent erosion caused by wave action. But bulkheads also can serve as a barrier to changes along the shoreline — including the upward migration of sands and gravels on the beach. As the sea level rises, both the high-tide and the low-tide lines get closer to the bulkhead. At first, only the upper beach habitat gets cut off. Later, as the low-tide mark creeps closer and closer to the barrier, suitable spawning areas for forage fish narrows and may disappear altogether. This narrowing of the beach, caused by the combination of a changing sea level and a fixed bulkhead, is known as “coastal squeeze” or “beach squeeze.” Since surf smelt spawn higher on the beach than sand lance, surf smelt habitat is likely to be squeezed out first. How fast this habitat loss occurs depends on the rate of sea-level rise and actions people may take to save the habitat. In most areas of Puget Sound, sea level has been rising faster than at any time during the past 2,000 years, according to climatologists with the University of Washington’s Climate Impacts Group. They say the melting of ice in the polar regions, which is caused by global warming, is likely to increase the rate of sea-level rise over time. The rate of rise varies slightly from place to place in Puget Sound. In Seattle, for example, sea level has risen about 9 inches since 1900, or about 0.8 inches per decade. Sea-level rise in Friday Harbor in North Puget Sound is about half that rate. Sea level rise for much of Puget Sound has been greater than the world average, because the land itself has been subsiding, or sinking, due to geologic forces. A few areas have been uplifting, or rising, which has resulted in a drop in local sea level. The land at Neah Bay, for example, has uplifted enough to cause a measured drop in local sea level. As the average rate of sea-level rise increases across the globe, Neah Bay is likely to be the only place in Western Washington where the local sea level remains the same or continues to drop, according to a report from the Climate Impacts Group. Predicting global sea level at a given time in the future is difficult, largely because of the uncertainty about how fast ice will melt in the polar regions and how quickly people will reduce their emissions of greenhouse gases. Predicting local sea level rise is even more difficult because of local differences of uplift or subsidence and factors related to precipitation, water storage and changes in the landscape. A 2009 Fish and Wildlife study suggests that when sea levels rise by 27 inches, about 80 percent of the forage fish spawning habitat in front of bulkheads will be lost to beach squeeze. At the time of the study, 27 inches was considered to be the highest level that might be expected by the turn of the century, based on a variety of climate models, each with its own assumptions. With new data and recent adjustments in climate modeling, 27 inches now appears close to the middle of the range predicted for 2100, with the full range stretching from 14 to 54 inches, according to the Intergovernmental Panel on Climate Change. Lara Whitely Binder of the Climate Impacts Group said a sea-level rise of 27 inches is likely to be reached, based on the current models. Whether that occurs around the end of the century or within the next 30 years cannot be predicted with current information. 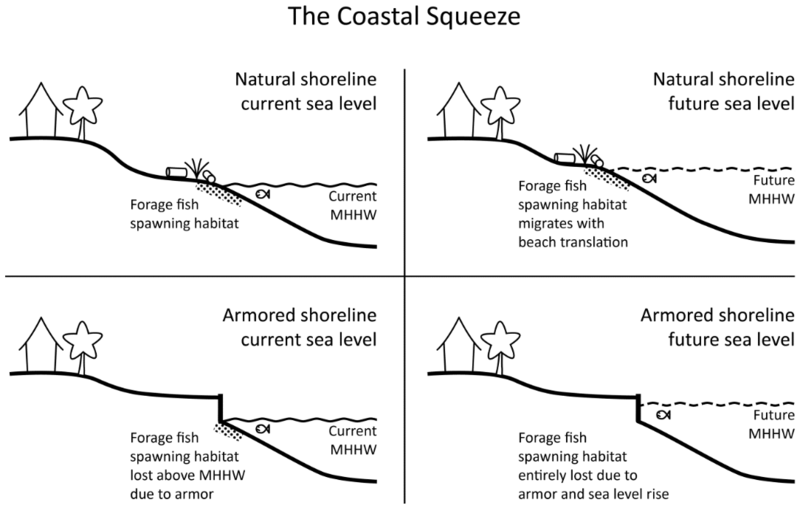 The loss of spawning habitat predicted by the Fish and Wildlife study is considered a conservative estimate, because it assumes that bulkheads are placed at 1.5 feet in elevation above the average daily high-tide line. In reality, many bulkheads — especially the older ones — are located lower on the beach. Bulkheads lower on the beach will squeeze out the spawning habitat even sooner, especially for surf smelt. More recently, a 2014 study funded by Fish and Wildlife through an agreement with the EPA looked at forage fish spawning beaches in San Juan County. The county has more shoreline than any other county in the contiguous United States, making it especially vulnerable to sea level rise. The study found that 35% of surf smelt eggs were at or above the average high tide mark, More than 80 per cent occurred in the upper third of the beach. It is yet to be seen whether surf smelt could adapt to lower areas of a beach if upper areas are no longer available, Quinn said, but these fish clearly prefer areas that are under water for relatively short periods of time. The reason has not been determined, but they might be trying to avoid predatory fish or elevate the temperature so their eggs can hatch faster. Sand lance are known to spawn in intertidal areas low on the beach. Whether the eggs can survive at even lower elevations, where they would remain submerged, has not yet been studied. In the future, as sea-level rise allows more waves to crash into bulkheads, beaches may change in other ways, Quinn said. Experience has shown that bulkheads can lead to a loss of beach sediments and reduce the natural deposition of driftwood. But those effects on forage fish habitat have not been studied. 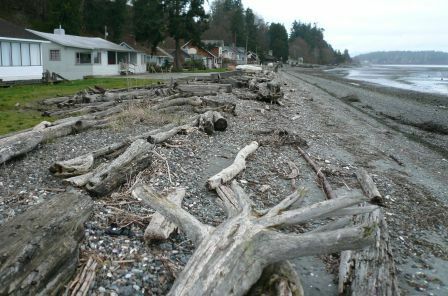 So-called soft-shore protections, such as imbedding logs and rocks in the beach, can help reduce erosion of shoreline property with less habitat damage than bulkheads, he said. Tim Gates, shoreline policy lead for the Washington Department of Ecology, said updated county shoreline regulations prohibit new bulkheads without a “demonstrated need” to protect a house or major structure from damage. As sea level rises, however, more homes are likely to be threatened by high water, increasing property owner requests for new bulkheads. So far, sea-level rise has not been incorporated into setback rules to keep new houses out of harm’s way, Gates said. But some counties have a policy of discussing the potential of high water with property owners during shoreline permitting. The uncertainty of sea level rise makes those discussions difficult, he said, and requiring additional setbacks cannot be justified with current projections. Besides, he added, a setback that might be needed for a sloping beach would be different than a setback needed for a beach that is relatively flat. One thing people need to understand is that today’s extreme high tides will become more common in the future and that new extremes will bring water to upland areas that have never been wet before, he said. An ongoing discussion about sea-level rise between state and county shoreline planners could help address public education and possibly lead to new regulations. Meanwhile, concerns continue about the effects of shoreline armoring in Puget Sound, where the total length of bulkheads occupy 27 percent of the shoreline. Puget Sound Partnership, which oversees the restoration of Puget Sound, has established a goal of removing more bulkheads (by total length) than get constructed over the coming years. Sea-level rise may work against that goal. 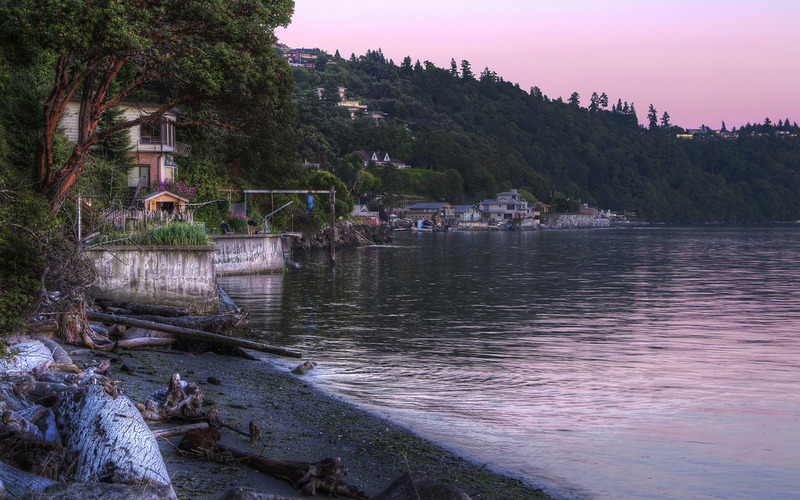 Instead of removing their bulkheads, some shoreline property owners may wish to raise them or extend them to protect their homes against rising waters. Thus the future poses an even greater challenge for protecting and restoring habitat for critical forage fish populations. Additional sources: Kinney et al. (2015). Analysis of effective regulation and stewardship findings: A review of Puget Sound Marine and Nearshore Grant Program results, part 1. University of Washington Puget Sound Institute. 57 pages.